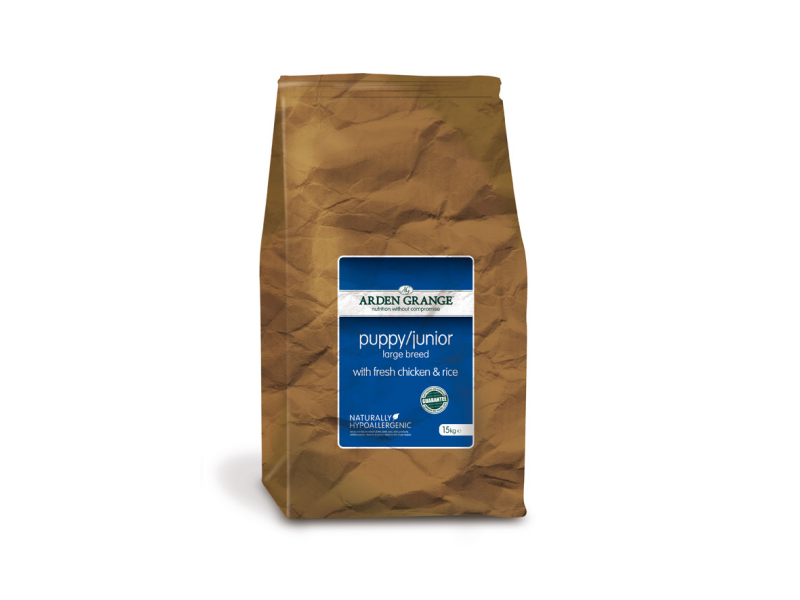 A unique, tailored diet for large breed puppies and juniors, containing a balance of controlled fats and proteins for healthy growth and development. The food is both palatable and highly digestible, and combines calorie-dense chicken for building muscle and strengthening natural immunity. Nutrients are controlled to prevent excess weight gain and additional glucosamine, chondroitin and MSM are combined for strengthening joints during skeletal development. Trace Elements: Zinc chelate of amino acid hydrate 292mg, Zinc sulphate monohydrate 243mg, Ferrous sulphate monohydrate 146mg, Manganese sulphate monohydrate 101mg, Cupric sulphate pentahydrate 35mg, Copper chelate of amino acid hydrate 29mg, Ferrous chelate of amino acid hydrate 29mg, Calcium iodate anhydrous 2.1mg, Sodium selenite 0.6mg. Antioxidants (rosemary and tocopherol-rich extracts). Arden Grange Adult Large Breed may be fed from 12 months of age; giant breeds may not reach skeletal maturity until upwards of 18 months. There are currently no questions for Arden Grange Large Breed With Fresh Chicken & Rice Puppy Food - be the first to ask one!